In the previous section, you adjusted the sizes and attributes of foreground pages. You can use the same techniques to resize and adjust attributes of background pages. The drawing you just opened contains four pages, each of which contains a collection of shapes, and each page has a different theme applied to it. In addition, each page name reflects the contents of the page. The shapes and themes on each page exist so you can quickly tell one page from another as you complete the steps in this exercise. Notice, also, that the drawing for this exercise was created using the metric template. On the Insert tab, in the Pages group, click the New Page arrow (not the button), and then click Background Page. 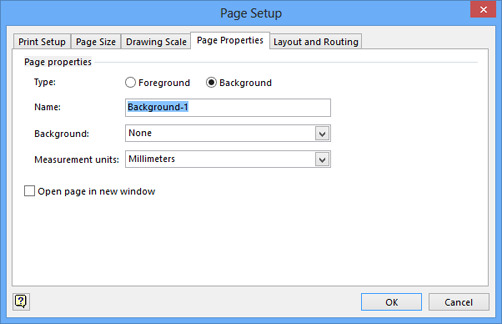 The same Page Setup dialog box that you saw in the previous exercise opens to the Page Properties tab, however, in this case the Type is preset to Background and the default page name is Background-1. Click OK. Visio creates the background page. If the tab for the new page doesn’t show the entire name Background-1, click any other page name tab, and then click back to the background tab. Remember that the attributes of the active page determine the attributes of each new page. If your drawing contains pages with different orientations or settings, activate the page that is like, or most like, your desired background page before creating the new page. On the Insert tab, in the Illustrations group, click the Picture button, navigate to the Starfish.jpg, and then click Open. Visio inserts the picture into the center of the drawing window. You will use this picture as a stand-in for a company logo. Drag the starfish picture to the upper-right corner of the page, and then resize it so it is approximately 25 mm (1 inch) wide. Remember that when you have selected a shape, its current width and height are displayed in the status bar at the bottom of the Visio window. As you drag the corner resize handle, the status bar updates dynamically to show the current size. You can include “Company Confidential” or other text on the pages in your diagram by adding a text box to the background page. Now that you’ve created a background page, you can apply it to one or more foreground pages. Right-click on the Squares page name tab, and then click Page Setup. The Page Setup dialog box opens to the Page Properties tab. Because the starfish is on a background page, you cannot select, change, or relocate it on this page. You must go to the background page to make changes. Applying background pages is done per page. When you navigate to the Circles or Triangles pages, they do not show the background. If you create a new page from an active page that includes a background page, the new page will also include the background page. Go to the Circles page. Notice that the background was not applied to this page. 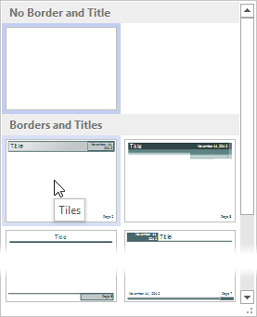 On the Design tab, in the Background group, click the Borders & Titles button to open the Borders & Titles gallery. As you point to any thumbnail in the gallery, its name is displayed as pop-up text. Be sure to notice that there is a scroll bar at the right giving you access to additional selections. Click the Tiles thumbnail, which should be toward the upper left. 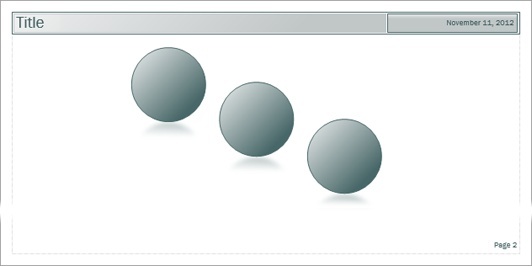 Visio creates a background page containing the title shapes and applies it to the Circles page. Most of the title box that appears across the top of the page is reserved for the document title, but the right portion contains today’s date. There is also a page number in the lower-right corner. The page number will be updated dynamically if you add, delete, or reorder pages. The automatically generated background page is called VBackground-1. Visio includes the letter V to distinguish the background page it created from the one you created manually. Go to VBackground-1, click in the Title text box, and then type Tailspin Toys. Go to Circles. The Circles foreground page reflects the change you made on the background page. Go to the Triangles page. On the Design tab, in the Background group, click the Backgrounds button to view a gallery of available backgrounds. Each thumbnail displays the colors and effects of the theme applied to this page. The name is viewable when you point to any background. Scroll down in the background gallery and click once on the Verve background. 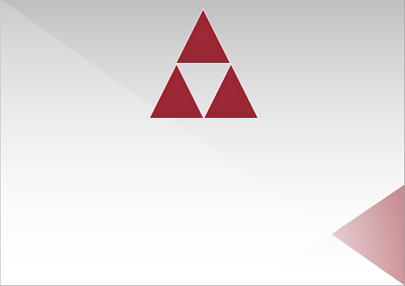 Visio creates a new background page called VBackground-2, and applies it to Triangles. Go to the Arrows page. Note that it does not include any of the backgrounds you’ve created for other pages in the drawing. Right-click the Arrows page name tab, and then select Page Setup. In the Background list, select Background-1, and then click OK.
You have now assigned the same background page to both Triangles and Squares. CLEAN UP Save your changes to the Background Exercises drawing, and then close it. Changes you make to a background page appear on all pages using that background page. If you have foreground pages with different orientations or sizes, you are likely to need multiple background pages with attributes that match the foreground pages. Background pages can have background pages. It is possible, therefore, to build a set of foreground pages that all display shapes from a common background page. (Think of it as the “deep background” page.) Those same foreground pages can also display the contents of other background pages that are unique to an individual page or to a group of pages. The page name tabs for background pages always appear to the right of all foreground pages and they cannot be reordered. Background page names are italicized.